The Oreo cookie turned 100 years old on March 6th, 2012. Yes, the chocolate wafers filled with crème have been around since 1912. The cookies had humble origins, the first tins selling for 30 cents each in Hoboken, New Jersey. Today, the cookies remain the best-selling in the world, with $2 billion in global sales just last year. They’re sold in over 100 different countries, selling best in the US, China, Venezuela, Canada, and Indonesia. But why are these cookies so universally beloved? 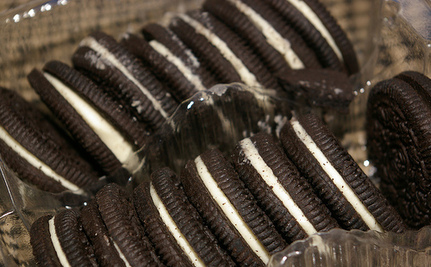 It’s no secret that Oreos are terrible for you – they’re packed with both sugar and high-fructose corn syrup. Just 3 cookies give you 160 mg of sodium and 160 calories. They have no meaningful nutritional content. The label won’t even tell you exactly what vegetable oil is used in the cookies – it could be canola, palm, or soybean – bad news for those out there with food allergies. Really, the only good thing you can say about the ingredient label is that Kraft eliminated trans fats from the product in 2005. After pressure from a lawsuit filed by the Campaign To Ban Partially Hydrogenated Oils in 2003, Kraft promised to reduce or remove trans fats in all of its products. Why do we love processed foods so much, when we know they’re terrible for us? Why is it so hard for people to let go of them? Is it a matter of simple convenience? A lack of motivation to bake our own, slightly healthier (certainly fresher and tastier) cookies at home? Or is it an emotional attachment? Do our childhood memories bring us back to these foods as adults, and keep us sharing them with new generations? I’m not sure of the answers. So I’ll pose a couple questions to Care2 readers. Are you an Oreo aficionado? What do you love about the cookies – and how are you celebrating 100 years of the world’s most popular cookie? Oreos taste okay, but they are so bad for us! 100 years too long? I love Oreos dipped in milk. Yummm!! I never did like Oreo cookies. But many people do and I think it brings back nostalgic memories of their childhood. That's what they reach for when they're happy or sad. Cookies and milk are a comfort food. Oreos are an American institution! I worked for Nabisco for 5 years and ate enough of them to last almost a lifetime. Oreos dipped in milk... that's what childhood tastes like. Oreos were made with lard until about a decade ago. When I went vegetarian I had to stop eating them; then the company joined the 20th century (yes 20th) and made them meat-free. Oreos are yummy and if I am going to eat cookies (which are all bad for you) oreos would be one of my first choices.